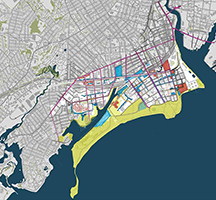 Resilient Bridgeport is a prototype for the region’s coastal cities. Led by the State of Connecticut, it consists of a resilience strategy and pilot projects focused on protecting homes, businesses and infrastructure in the South End of Bridgeport from chronic and acute flooding in order to foster long-term prosperity in the neighborhood. Resilient Bridgeport is part of the Connecticut Department of Housing Sandy Recovery and National Disaster Resilience programs funded by the Federal Department of Housing and Urban Development Community Development Block Grant Disaster Recovery program under Public Law 113-2. Resilient Bridgeport builds on planning efforts initiated by the U.S. Department of Housing and Urban Development in 2013, during the Rebuild by Design Competition. 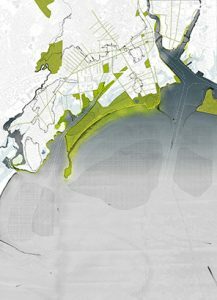 That is when designers and the Bridgeport community began to develop a comprehensive strategy for protecting the city from future storms and the anticipated effects of climate change and sea level rise. Hurricanes are not the only source of flooding and disruption in Bridgeport. Intense rainstorms in the summer of 2016 caused significant flooding and showed the importance of addressing both chronic and acute flooding. Climate change will worsen the effects of these storms. 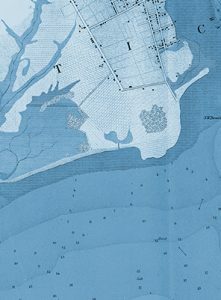 Bridgeport’s present day issues with the waters that flow around, through, and beneath Bridgeport are easier to understand when one sees how human inhabitation has reshaped the city’s coastline and enabled development on former wetlands. 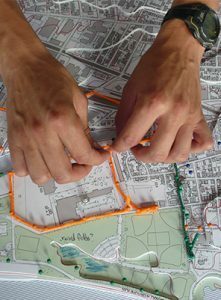 Mapping and analyzing these changes and other aspects of Bridgeport’s past and present are important steps in the design process. Understanding how the landscape and water’s edge have come to be as they are makes it easier to imagine what the coastline will be in the future. Resilient Bridgeport defines a path towards making the city a safer place for residents. Equally important are goals related to supporting urban development that is sustainable and equitable, improving quality of life, enhancing ecology, celebrating culture and identity, and providing opportunities for diverse members of the community to contribute to the transformation of the city and its coastline. Resilient Bridgeport comprises a resilience strategy and pilot project. The strategy describes a 40-50 year transformation of the city’s vulnerable, low-lying areas. Included are strategies relating to surge protection, stormwater, coastal habitats and buffers, utilities, connectivity, and urban redevelopment. The pilot project provides immediate and short-term opportunities for managing water and improving access and connectivity during both dry and wet weather. The pilot project incorporates green features that store large volumes of stormwater in the landscape. These features reduce runoff and peak flow rates, which lessens the load on existing combined sewer systems and reduces flooding. Storm sewer separation and the addition of a pump provide additional relief. New features are designed as beautiful public spaces that are amenities for the whole neighborhood, so that building resilience also revitalizes the neighborhood and enriches the city. Learning and working together is vital to the design process. Through bike tours, walking tours, presentations, discussions, and design workshops, Bridgeport residents, business owners, and stakeholders from around the region have contributed to the ideas and proposals that make up Resilient Bridgeport. Through Resilient Bridgeport, a joint urban design, architecture, engineering, planning, and community engagement team is working with the State of Connecticut’s Department of Housing, the City of Bridgeport, and Bridgeport residents and business owners to develop a resilience strategy and pilot project for the Bridgeport’s South End and Black Rock Harbor areas. This work is funded by HUD as part of the federal response to Hurricane Sandy (2012) and the extensive damage to communities throughout the Northeast caused by the hurricane. 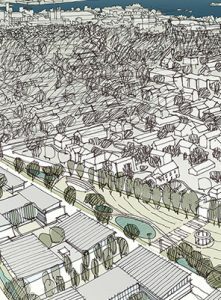 With a number of national partners, the U.S. Department of Housing and Urban Development launched Rebuild by Design in 2013 as a design competition, and began working with design teams, researchers, and communities in the Sandy-affected region and around the country to improve their resilience, prepare for the anticipated effects of climate change, and generate and implement protypical solutions. In 2014, HUD initiated the National Disaster Resilience Competition, which broadens federal support for resilience efforts to communities across the nation. Through NDRC, the Connecticut DOH received an additional $42 million in funding for another pilot project in Bridgeport’s South End. With NDRC and RBD funding and the support of federal, state, and local partners, Bridgeport has the opportunity to show how a comprehensive and multi-layered approach to building resilience that integrates adaptation, protection, and revitalization possibilities can reduce risk and enhance quality of life along the water’s edge. 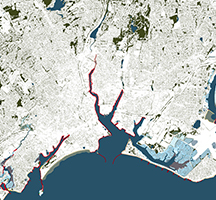 As climate change and sea level rise begin to exacerbate the effects of future hurricanes, storm surge, and heavy rainfall, it is crucial, now, to begin the process of adapting Bridgeport’s streets, public spaces, infrastructure networks, and architecture to meet the needs and challenges of the 21st century. To learn more about these challenges, visit What is Resilience? The adaptation process requires a shared vision that is both far-reaching and actionable. 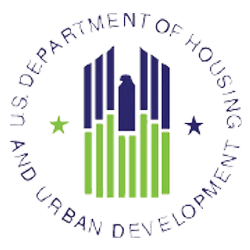 State and municipal agencies, institutions, nonprofits, the design and building industries, business owners, and residents will need to come together and make measurable strides towards that vision. These include learning more about the impact of climate change and sea level rise on Bridgeport, ensuring that a diversity of voices is represented in the creation of that vision, coordinating investments in long-term planning and infrastructure, and adapting a wide range of public and private assets so that the Bridgeport of 2030 is safer, more beautiful, and more prosperous than the Bridgeport of today. Resilient Bridgeport provides a framework for the community to define and implement that vision. 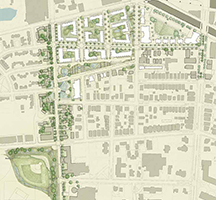 Though Resilient Bridgeport is grounded in the study and design for a specific area, it is also intended to serve as a model for other parts of Bridgeport and other cities in the region. To learn more about this framework, visit Planning for Adaptation. The process also yields a pilot project for the South End of Bridgeport that demonstrates resilient design strategies, tests new ideas, builds the capacity of stakeholders to work together on future projects, and demonstrates how “living with water” can protect, sustain, and enhance a neighborhood. To learn more, visit Projects + Proposals. To receive updates, sign up for the Newsletter at the bottom of the page. To learn about other ways to share your insights, comments, and knowledge, please visit Get Involved. The team develops planning and design strategies for the overall study area as well as concepts for the pilot project. 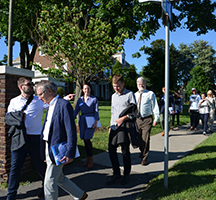 Through community engagement efforts that include walking tours and hands-on workshops, the team connects with a broad constituency on critical topics, including climate change, sea level rise, historic preservation, development, as well as specific project goals, design concepts, and design principles. Completed spring 2017. The team iterates and refines the proposed strategies and pilot project concept through stakeholder engagement, community input, engineering analysis, and environmental analysis. The team works to understand the anticipated environmental, social, and economic impacts of proposals for stormwater networks, surge protection measures, dry egress, green buffers, microgrids, building adaptations, new development. The team outlines priorities and implementation strategies. Completed Spring 2017. The team develops the final report, a resource and document that establishes a clear and comprehensive framework for building resilience. This framework will allow each future investment and project – public or private, large or small – to contribute to a shared vision. The team is also developing the design for the proposed pilot project in preparation for the environmental review process and construction that begins in 2019. Expected completion in spring 2017.